The term bush beans refers to the growing habit of the bean plant. Bush beans are of the determinate type which means they grow to a certain height, 15-24 inches (38-60 cm) tall. They then blossom, produce pods and stop growing. They will bear a full crop over a short space of time, usually 50-60 days. The only thing better than a good feed of fresh garden beans in the summer is the taste of fresh home canned beans from your own pantry in the deep dark depths of winter. 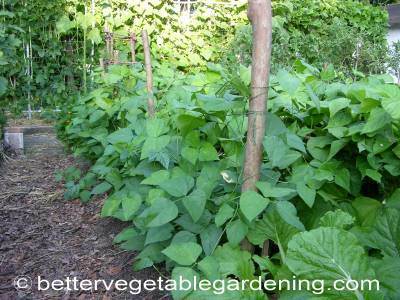 Bush beans are a caners dream come true with the abundance that even a small plot of beans can produce. 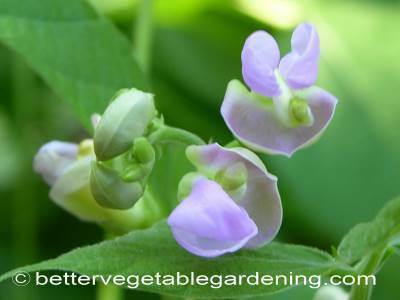 Most bean types are self pollinating and therefore different varieties are able to be grown in close proximity with little danger of cross pollination making it possible to grow a good variety of beans. There are numerous varieties of beans and many have both bush and climbing types. Some can be eaten only as green beans while others as shelled beans. A few can be consumed as green or shelled. Growing conditions for bush beans regardless of variety are much the same. They are a frost tender, warm season vegetable needing soil temperatures of at least 60F (16 C). They are sensitive to cold temperatures, seeds of most bean varieties germinate poorly, or rot very quickly in cold wet soil conditions. There is always the odd ball in every camp and Broad Beans are just that. Most bush bean varieties prefer a sunny position with a very minimum of 4-6 hours of direct sunlight daily. They grow best when temperatures are in the 70-95 F (21-35 C) range. When growing bush beans a rich organic soil that drains well with soil pH above 6.0. will produce a very good supply of fresh garden beans. 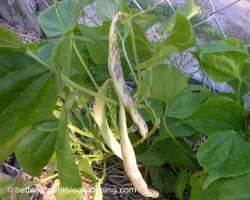 Bush Beans should not be planted until after all danger of frost is past in the spring. Wait until at least 1-2 weeks after the last average 32 F (0 C) freeze in your area but not before soil temperature are consistently 60 F(16 C) or above. 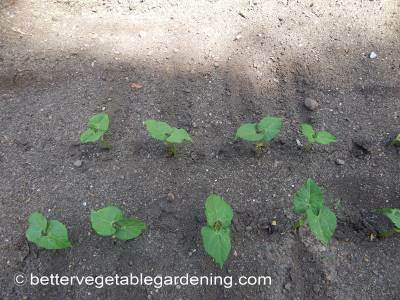 The traditional way to plant bush beans is to direct sow seeds 2 inch ( 50 mm) deep and 2 inches apart in rows 18-24 inches (45-60 cm) apart. 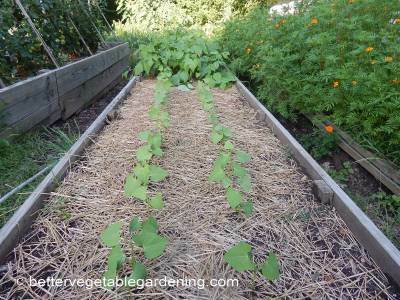 Raised bed gardens are perfect for growing bush beans. Planting two rows approximately 18 inches (45 cm) apart allows easy picking from either side of the bed. 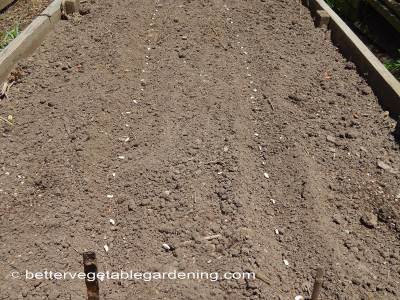 Alternatively plant a double row of seeds 6 inches apart. 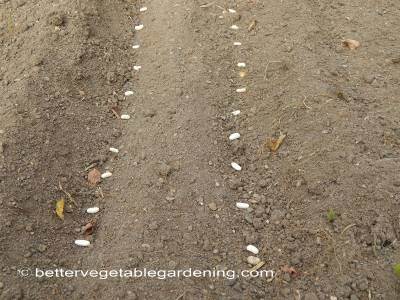 Plant seeds in both rows 2-3 inches (approx 5-8 cm) apart. Bush beans produce over a short period, approximately 6 weeks, to ensure a continuous supply all summer plant bush beans every 2-3 weeks. 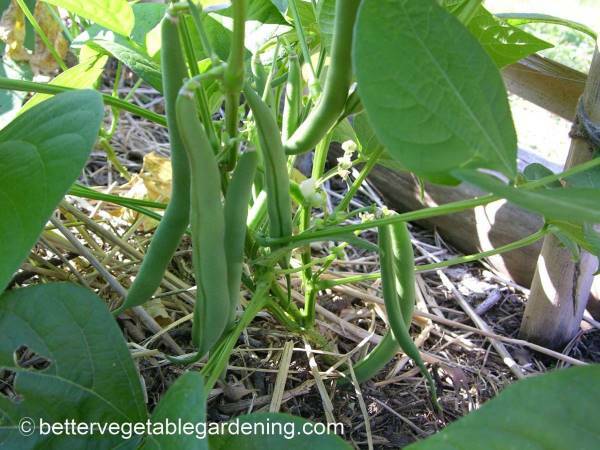 Growing bush beans is easy when the few plant care tips below are followed. When seedlings are 2-3 inches (5-8 cm) tall, thin them to the strongest plants, approximately 4 inches (10 cm) apart. Wait until the seeds emerge and are 2-3 inches (5-7 cm) tall then thin to the strongest plants. 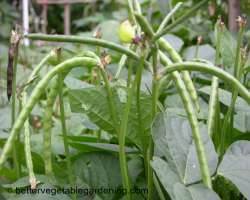 Bush beans have shallow roots, it is better to keep weed under control by hand weeding from the beginning when the weeds are small and easy to pull rather than leaving them until mechanical or hand hoeing is necessary. Applying a good thick mulch as soon as the seeds are above ground will go a long way to helping control all but the most resistant weeds. Don’t over water your bean seeds. Like many vegetables, consistent soil moisture content, damp but not soaking is best. Say yes to the mulch. 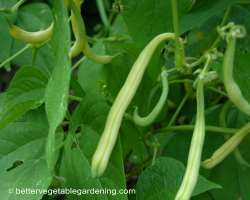 Fertilizer requirements for growing bush beans is similar to pole beans. 2-3 quarts per 100 sq feet (2.2-3.3 liters per 9.3 square meters) before planting of a good all-Purpose Organic Fertilizer and the same rate for each side dressing. Apply fertilizer 2 - 3 weeks before sowing and only one side dressing, just as the flowers start to appear. 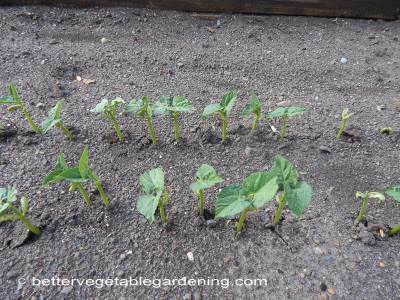 Most bush bean varieties don't need support. However with some semi bush varieties a low support system helps to keep plants upright and assists in harvesting. Usually its simply a couple of sticks with some garden twine. 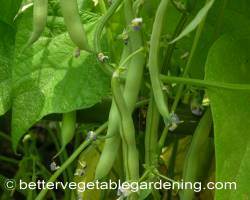 Crop rotation is as important with beans as it is with other vegetables. This is mainly to reduce the incidence of garden pests and diseases carried over in the soil from the previous year’s crops. Bush beans, depending on climate and variety, will take around 50-60 days from germination to maturity. It is especially important to pick bush beans daily while they are young and fleshy and the seeds in the pods small and green. If too many pods are allowed to reach maturity the plants will slow down in producing new pods. Picking regularly will insure the plants produce their maximum yield. 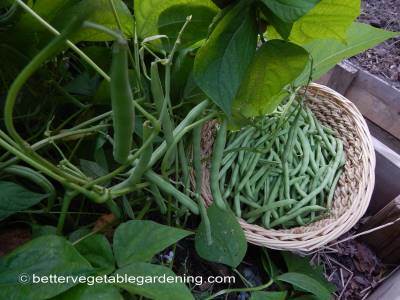 Bush beans similar to pole beans are best stored at 40-45 F (4-7 C) with 95-100% humidity. They will store well for up to 8-12 days under these conditions.